The World Open is the richest prize money tournament in the US. My focus has to be to climb the rating and norm charts and play the Open section, particularly since I had momentum coming off a strong performance at the New York International days earlier where I earned an IM Norm. Playing a U2400 FIDE tournament held only rating risk for me since I would most likely be the highest FIDE rated player – which was eventually true. But I got tempted at the opportunity of a guaranteed grand prize money of $9,000 or potentially higher for first place. That would contribute a long way to funding my trip to perhaps Europe and/or World Youth in UAE or additional coaching. Finding sponsorship is very hard, as per my experience thus far. So here was a chance now to do something on my own. Norms will have to wait. I had to raise some money, and I decided to play the U2400 section. To make a long story short, I failed 🙁 . I still wanted to write about this tournament because often it’s easy to write about Successes, but not about our Failures or times when we come up empty-handed. So I decided to write about two such recent tournaments – World Open and Quebec Open. The road to success is paved with many failures. I’m learning that failures are unavoidable. They are very painful when they happen. But they are making me stronger for the next time. Each failure brings me closer to success. When I look back, I find this quite true from my limited Chess experience over 4 1/2 years. It’s okay to fail, but what’s important is to Learn and Move On! Now to make a short story long, here’s how it went 🙂 . We headed out to DC on July 7, the day of the tournament. 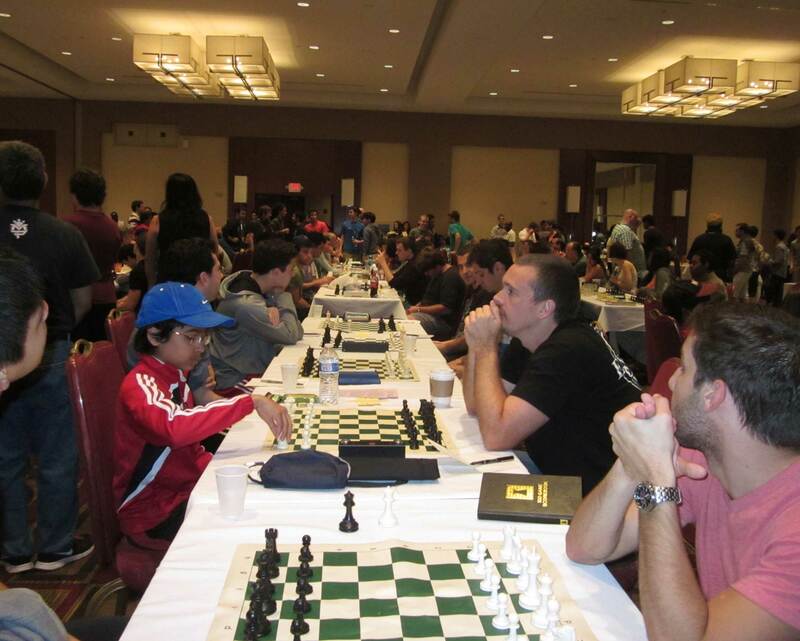 The tournament was being held at the Hyatt Regency, over a span of 5 days. Time Control for U2400 section was 115 min (5 sec delay) and an addition of 1 hour after 40 moves. The first round was at 6pm, so there was plenty of time to relax. I decided to use the time to sleep, since the round was late and I would need the energy to keep me going :). I was playing Black, and paired with Denis Strenzwilk (1951 FIDE), an experienced veteran player. I slowly but surely outplayed him, but then erred with a nonsensical Rook transfer. Denis was able to exchange Rooks, after which winning seemed virtually impossible. I managed to get my King and Knight into their ideal positions, whereafter White blundered, allowing me to penetrate with my King. Denis resigned shortly after. 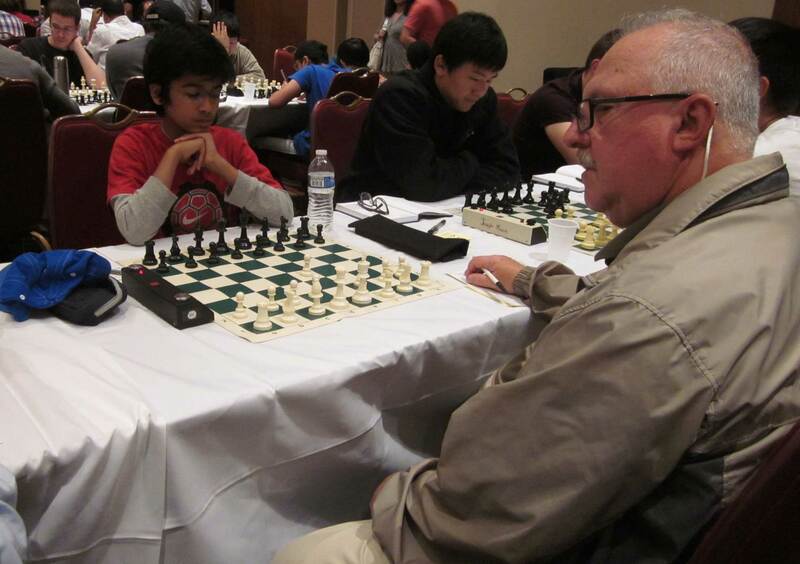 The 2nd round had me paired with Chris Mabe (2250 FIDE) from North Carolina. He played a line which I was unfamiliar with, so I just played some common moves. I misplayed the middlegame however, and his position became slightly better. I was getting ready to offer a Draw, when suddenly Chris blundered ! I won a couple moves later. I was 2/2 , but my play wasn’t convincing. 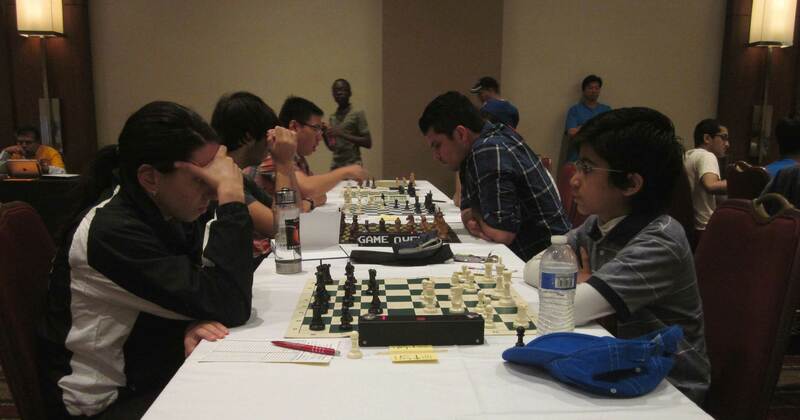 I played with IM Angelo Young (2315 FIDE) in the third round. We were both out of theory from move 2 (!) and were spending a lot of time. By move 25, I was down to 6 minutes, while he had 3. It was more or less even, until he blundered with Ra1? ?, which I refuted with the tactical c4 ! I reached the time control an exchange up. However Angelo still had a pretty obvious Draw. He sunk into thought for 40 minutes, before playing b3 ?? From there on my technique was excellent and I managed to win the game. I lost the next round to Iryna Zenyuk (2250 FIDE), won the next game with Osmekhian Innocent Omoifo (2180 FIDE), but then again suffered a setback by losing to Grant Xu (2125 FIDE). Grant had even offered a Draw, but I thought I could tinker around with no real risks for a while,even though I had no real winning chances. I feel that as I mature as a chess player, I’ll be able to make better decisions in the future, such as knowing when to Draw. I finished the tournament at 6.5/9, with an extremely lucky win in the last round against Andrew Tang (2150 FIDE). I just wasn’t able to find my rhythm in this tournament. Perhaps it was the subconscious pressure of trying to win the first prize for my Quest. Or it could be that I just couldn’t accept strategic Draws, for winning it all was important to me. A mind is a funny thing. The tapestry of the mind changes with each tournament. I was really disappointed with the fact that I’d squandered a great opportunity to fund my dream. But i’m not giving up on my Quest. I will continue to look out for opportunities for chess funds and sponsorship. After winning the K-9 US SuperNational Championship, I sent out sponsorship requests to a few places. But there was no response. It’s not easy. No wonder becoming a Champion is super hard and requires patience, focus, adaptability, grit and unrelenting hard work. It’s true in Chess and in Life.